Inder Loves Folk Art: "Are you making my pink dress, mama?" As you know, little Maggie has become increasingly opinionated about the clothing she wears. Namely, she wants everything to be pink, pink, pink! Initially I resisted the pink-everything trend, and to be honest, I am still looking forward to a time in the future when I can sew blue, or red, or orange, or green, or yellow things for Maggie. But in the meantime, when I see a pink fabric that I like, I've been picking up a yard or two, because you know, Maggie might like a dress from it. This Cotton + Steel Cookie Book Mini Flowers was one such impulse purchase. I love it and it's pink, so, BOOM. Two yards please. Kthxbai. 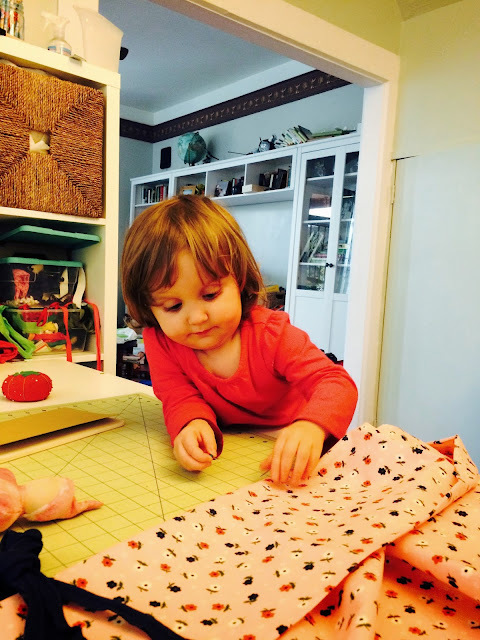 Maggie has also recently become a lot more interested in my sewing, and frequently stops by to ask me "What are you making, mama? Are you making a dress for me?" And by "frequently," I mean, "once every five minutes for days." This can make a selfish sewing project seem like it's taking a lot longer than it actually is. When I find myself repeating "No, I'm still making a shirt for Mama" a hundred times in one day, I start to feel like I must be pretty darn slow at this sewing business. 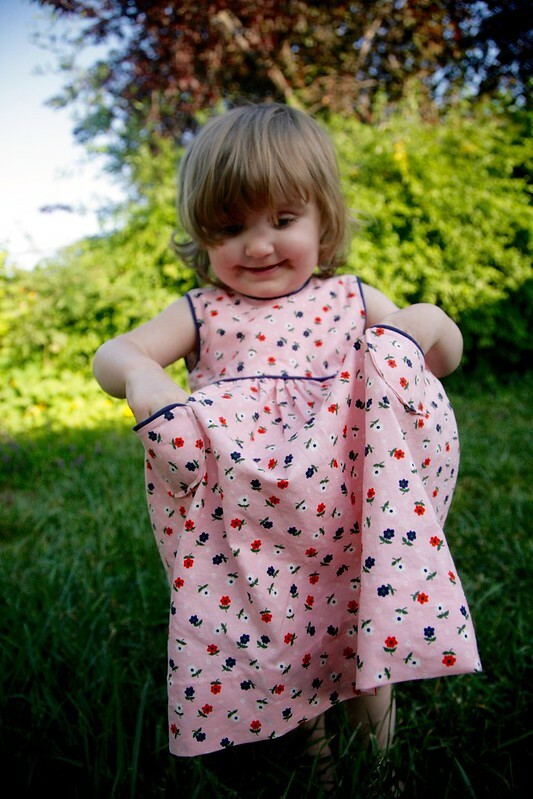 At one point, to buy myself some more time, I gave Maggie a little stack of pink fabrics in stash and asked her to pick her favorite for "a pink dress." She happily busied herself with the pile and the Cookie Book Mini Flowers emerged a clear winner for a "pink dress for me." Great! No problem, Maggie, I'll make you a pink dress ... soon! Well, that predictably backfired because after Maggie had chosen her fabric, her question changed to "Are you making my pink dress, Mama?" And when I'd explain that no, I was still making things for myself, she would respond with disappointment and a "When will you make my pink dress?" Rinse, repeat. Every five minutes for days. You have to love toddlers and their persistence, right? Well, you can guess how this ended. I got to work on Maggie's dress! Persistence pays off! I chose the Geranium Dress for a couple reasons: (1) Maggie loves the last one I made her and chooses it every chance she gets; (2) I already had the pattern cut out in her size and I knew it fit; and (3) I have been wanting to do another "fully piped" Geranium since the one I made for Maggie as a baby and this fabric just really seemed to cry for some piping. And look, she loves it! While being asked about Maggie's pink dress repeatedly can get to be a bit tiresome, I am thrilled (THRILLED, I tell you!) to sew for such a grateful and enthusiastic recipient! It's definitely very different than sewing for Joe has been in recent years (although he has softened a bit as of late, I notice). It's hard to understate how fun it is to sew something to order for an appreciative kid. If I had let Maggie choose the piping and buttons, you know how that would have gone, right? PINK PINK PINK PIIIIIIIIIIINK!!!!! So I did not consult with her on these points, ahem, and picked a dramatically dark navy piping and red buttons, to bring out the primary colors of the flowers in this fabric and play down the pink-pastel-ness. At this point, I'm thinking this isn't the first Geranium you've seen on a sewing blog (I've sewn a half-dozen, I think! ), but just for good record keeping purposes, this is view A (gathered skirt), sleeveless, with patch pockets and piping all around the neckline, back facings, waist seam, and armholes. 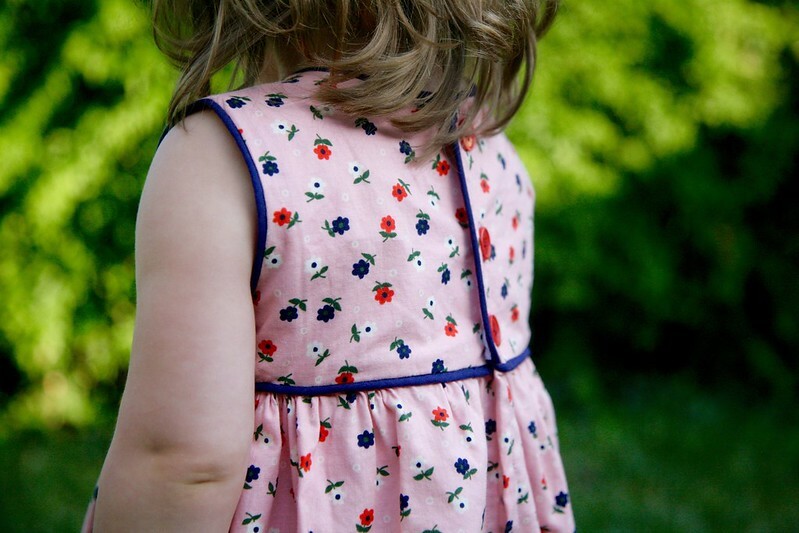 The only modification I made to size 18-25 months was to lengthen the dress by about three inches, and then make a nice deep three inch hem. The end result of this was slightly longer than my last version. My love affair with piping continues, obviously. It provides such a nice, clean finish. It does take a little bit longer than a regular finish, but it also prevents linings and facings from peeking out and gives a bodice like the Geranium bodice a bit more body and firmness. Plus, it just looks very sweetly traditional. As with my last version, I slipstitched the bodice lining to the waist and hemmed the dress by hand. It's such a small dress, it really doesn't take very long, and it gives a much more traditional look than topstitching, which I think is in keeping with this style of dress. So far I haven't had any problems with hems ripping out on the dresses I've made for Maggie. 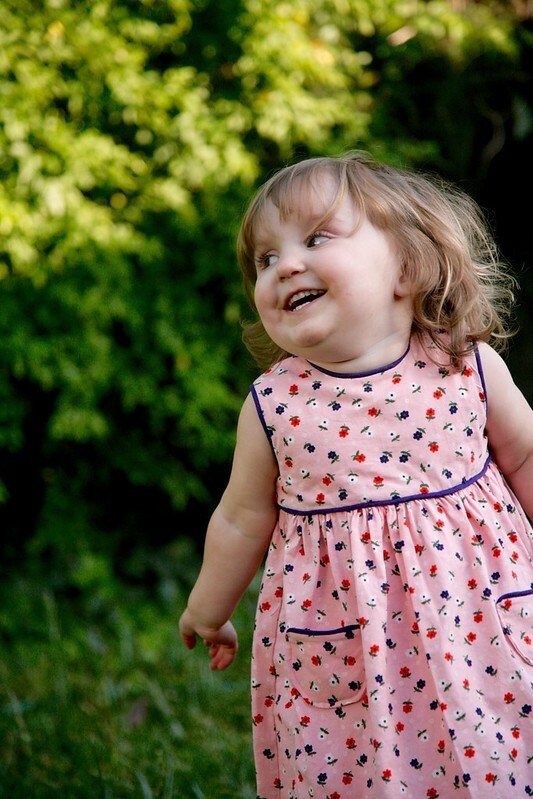 This girl loves to spin around on the lawn in a new dress! Can you guess what else she loves? POCKETS. Maggie is now at the age where pockets are all the rage. She's been filling up these pockets with softies, Lego minifigs, cars, and other useful and necessary items. I finished your pink dress, Maggie! Now can I get a little time to sew for myself? Oh, I can't wait!!! I want to sew blue and green and yellow and red things!!! And maybe even orange? Thank you, when I saw the navy against this fabric I knew it had to be - it matches but it also tones down the pink a little bit. Well done! 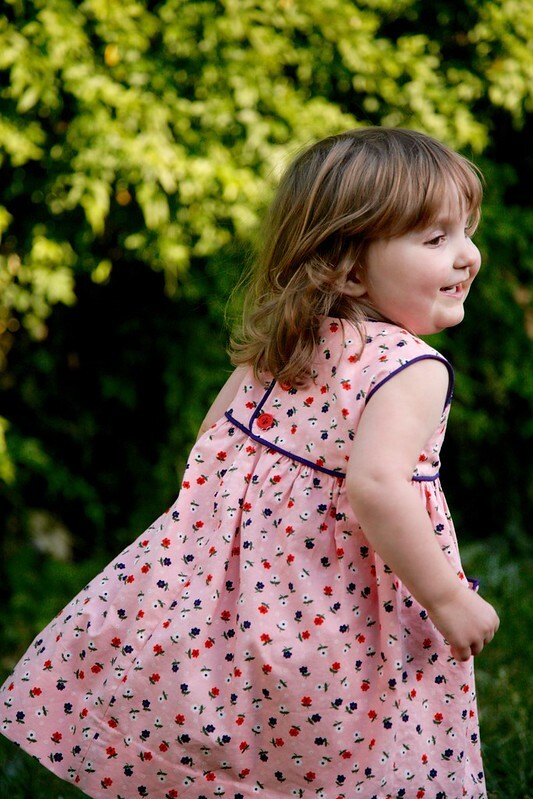 Glad Maggie got her pink dress :) The geranium dress is such a winner, isn't it. 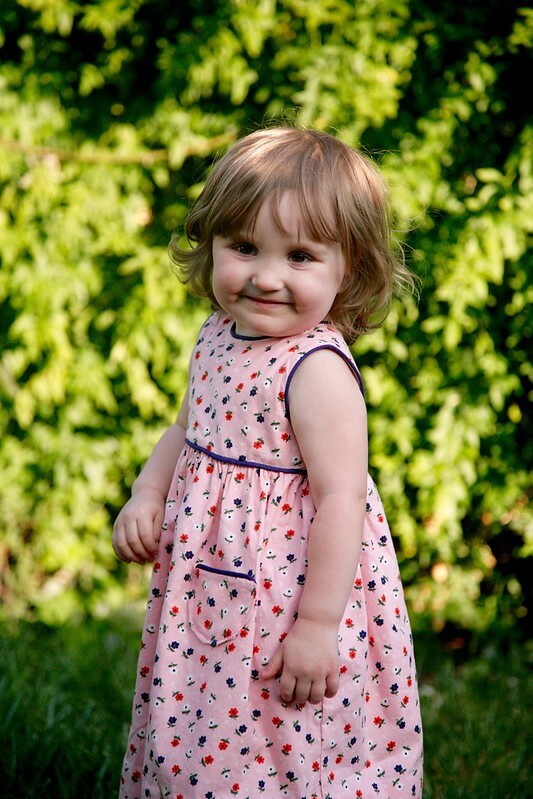 E wears the geranium dress I made for her at Christmas all the time. I need to make her another one before she outgrows the size 5. And I need some piping lessons from you- the blue sets off the pink so nicely! I adore this dress, Inder! And YES it is great sewing for enthusiastic recipients. My girls LOVE mama mades (whereas Jude is more neutral). Iris always asks who I'm seeing for - hopeful that it's her. And they love having photos taken in new clothes. Sewing* not seeing. Stupid auto correct! 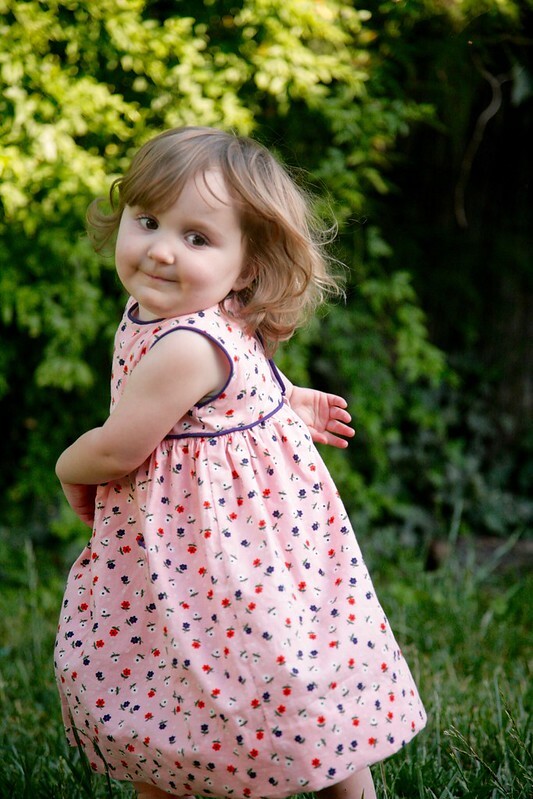 Aw, Maggie reminds me of Em when she was littler - the EVERYTHING MUST BE PINK phase, I remember it so clearly! She still likes pink the most, but is definitely more open to other colors now which is a relief. The dress is adorable and the piping is perfect. Nicely done! Beautiful dress, Inder, and Maggie is so adorable! 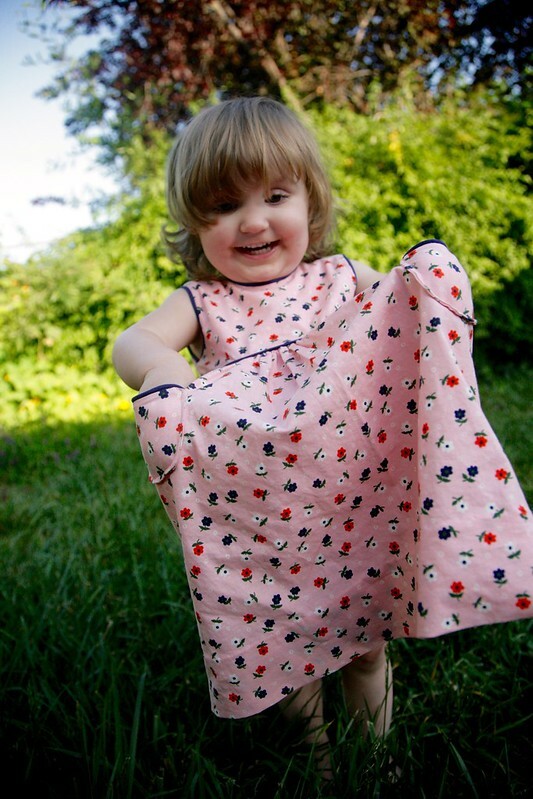 Isn't it the best when you find a fabric that both you and your little one both love. I love the green version even more than the pink! But Maggie would not have worn that dress with such glee. Perfection - and with pocketses! I just sewed the most boring looking blue zip-up hoodie for Charlie but it was exactly what he wanted and it turned out relly well and he's stoked, so yeah, totally worthwhile. I hope you're cramming in some good selfish sewing now! Arg, my comment got eaten! Inder, it is beautiful, I adore pink and navy and that dress is gorgeous. Thank you Nicole!! And sorry about your comment. Blogger needs to figure out a way to screen for spam without eating my favorite readers' comments! ARGH! That Maggie is cuteness on a stick!! Wonderful!